Sinibaldo Ibi was born in Perugia. He is first documented in 1496, when he joined with four other young artists in Perugia to form the so-called Workshop of 1496 (see below). His earliest known work was Gonfalon of St Ubaldus, which was commissioned by the Commune of Gubbio in 1503 (below). He seems to have remained in Gubbio until at least 1507, and his known work in Perugia began in ca. 1510. He is last documented in 1548, when he was elected for the sixth time as the treasurer of the Arte dei Pittori of his native city. It was also probably the work that was specified as being underway in Eusebio’s workshop in Perugia in the contract he signed in 1507 for the completion of the altarpiece by Pintoricchio in Sant’ Andrea, Spello: the contract allowed him to complete this existing commission but precluded him from leaving Spello for any other reason. The initials “LA SI” at the end of the inscription giving the date might indicate the involvement of two other members of the Workshop of 1496: Ludovico di Angelo and Sinibaldo Ibi. The altarpiece, which depicts the Madonna and Child enthroned with SS Peter, Catherine of Alexandria, Agatha and Paul and two praying angels above, is now in the Galleria Nazionale. The Confraternita di Sant’ Agostino commissioned this altarpiece, which is dated by inscription, from Berto di Giovanni and Sinibaldo Ibi for the Oratorio di Sant' Agostino. The altarpiece, which depicts the Madonna and Child enthroned with SS Augustine and Sebastian, was moved to the sacristy, possibly when the oratory was remodelled in the 17th century. The confraternity gave it to the Galleria Nazionale in 1872. This fresco on what was the altar wall of the hospice of the Oratorio di Sant' Agostino, which was rediscovered in 1991, depicts the Crucifixion with the Virgin and St John the Evangelist and the kneeling St Mary Magdalene. It was initially attributed to the young Raphael, but is now attributed to Berto di Giovanni, Sinibaldo Ibi and/or Lattanzio di Giovanni. ✴The main panel, which depicts the Madonna and Child enthroned with SS John the Baptist, Philip Benizi, Florentius and Joseph, passed to the Accademia di Belle Arti in 1810 and is now in the Galleria Nazionale. The altarpiece was subsequently moved to the Collegio dei Notai, probably in 1588 before that building was partly demolished, changing places with another altarpiece of the same subject that is attributed to Benedetto Bonfigli. The altarpiece by Sinibaldo Ibi seems to have returned to its original location in the early 19th century, and entered the Galleria Nazionale in 1863. Its original frame no longer survives. This damaged detached fresco, which is attributed to Sinibaldo Ibi and used to be dated by an inscription, was transferred from the Ospedale di Santa Maria della Misericordia to the Galleria Nazionale in 1879. The Commune commissioned this double-sided processional banner, which is signed by Sinibaldo Ibi and dated by inscription. ✴One side depicts the standing St Ubaldus in episcopal robes, his right hand raised in blessing, and two angels, one of which holds his episcopal staff. ✴The other side depicts the Madonna della Misericordia with musical angels and two groups of worshippers (one male and one female) kneel below. Two of the angels above the Madonna hold a crown above her head. The Commune entrusted the banner to the nuns of Santo Spirito, and it was carried in procession in times of need. On the feast days, the Confraternita dei Bianchi carried it in procession from Santo Spirito to the Duomo, where it stayed on the high altar for the octave of the feast. Controversy broke out in 1663, when the nuns unilaterally removed it from the Duomo on the feast of Corpus Cristi and installed it outside their nunnery. The Commune, at the behest of Bishop Alessandro Sperelli, ordered its return to the Duomo and insisted that it should be kept in the chapel of Palazzo dei Consoli thereafter. Cardinal Carlo Bichi, the vice-legate of the Romagna, mediated and arranged for the return to the status quo after the nuns had shown appropriate contrition. The banner was restored in 1742 (by Giuseppe Reposati), in 1780 and in 1832. It was enclosed in the present gilded wooden frame in 1833 and transferred “permanently” to the Duomo, although it continued to be used in processions. It was restored again and transferred to the Pinacoteca Civica in 1900. This altarpiece is in the Duomo (in the 8th bay on the left). According to an inscription, Girolamo Bentivogli commissioned it from Sinibaldo Ibi. The inscription records the month but not the year, which is thought to have been 1507. The altarpiece on the high altar of the church of the Franciscan nunnery of San Bernardino is attributed to Sinibaldo Ibi. It depicts the Madonna and Child with SS Peter, Paul, Francis and Bernardino. The altarpiece must already have been about 100 years old when it was placed on the high altar of the nuns’ new church. If they had originally commissioned it, this would have occurred soon after they acquired the complex. 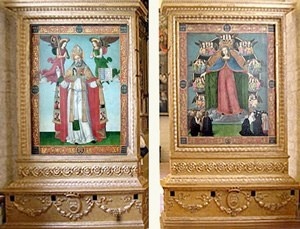 However, the figures of SS Francis and Bernardino seem to have been painted after the completion of the original altarpiece, and it may be that they acquired it from a non-Franciscan location and adapted it to their purposes. Return to Art in: Gubbio Orvieto Perugia.